I was in the Kennedy Meadows area of the Southern Sierra (not be confused with the Kennedy Meadows near Sonora Pass) for some rare January peakbagging while very little snow lay on the ground in this unusually dry season. The four separate hikes were of varying length though none very long, anywhere from 2-8 miles each, roundtrip. None of these named summits land on any peak list, but with varying amounts of prominence, all made for good destinations, providing fine views of the surrounding area, each with an old register going back decades. The peak is located about three miles west of Kennedy Meadows, just south of the Sherman Pass Rd. The pavement gets within a mile of the summit, but with ice on the road where it traverses the shadier north side of Pine Mtn, I was not able to get as close as I might have liked. But at less than five miles roundtrip, it wasn't all that difficult as it was. I found a place to park off the road just before the ice section and hoofed it up the road from there for almost a mile. The hardest part was trying to minimize the number of times I would slip on the ice where I couldn't avoid walking on it. Though it had been six weeks since it had last snowed, the little that fell was in no hurry to disappear. Unlike the springtime melt when the snow becomes a slushy mess, this stuff melts slowly and then refreezes again each night. On the road where none of the water can be absorbed into the ground, the result is that most of it just slowly transforms into a hard sheet of ice. No mud, no slush, just slowly diminishing snow and the creation of ice. At a turn in the road I left it to scramble up to a ridgeline which I followed up for almost 600ft, continuing in a mostly westerly direction. At the top of this ridge I turned left to head south more or less directly up towards the summit of Pine another 700ft higher. The moon was setting not long before sunrise came at 7a while I was still making my way up the north slope of Pine. This area and much of the Domelands Wilderness burned in the 2000 Manter Fire and there is still a long way to go for recovery. Most of the snags have fallen down, but brush currently dominates the landscape. The new pines are sprouting up but are many, many years from maturity. I had to dodge and weave through the healthy brush while avoiding snow patches as much as reasonable. Partially wet shoes wound be the result by the end of the day, but at least my socks wouldn't get soaked - just damp. It took just over an hour to reach the summit, by which time the sun was making the cold retreat and proving to be the making for a fine day. To the north one can be see the forested areas north of the road that were spared in the fire, part of the South Sierra Wilderness with Olancha Peak in the background. To the south is seen Rockhouse Basin and much of the Domelands Wilderness area. From a distance it does not look as bleak as the north side of Pine Mtn close up. Many of the trees scattered throughout the region were spared in the large fire complex and overall it is doing well on the road to recovery. The oldest register scrap went back to 1976, left by a Gordon MacLeod party. Smatko had visited in 1988 leaving his signature small register with thin strips of paper and a tiny pencil. Rather than the usual film cannister, this was a small plastic pill container for prenatal vitamins which only makes sense when you consider Dr. Smatko was a gynecologist. A hunter from Ridgecrest named Lyle Fisher left the current register in 1994 with only five pages of new names since then. With the day starting to warm some, I returned via the same route, getting back to the van by 8:30a. Located NE of Kennedy Meadows, at 9,256ft, Ball Mtn was the highest summit I would visit today. I drove back down to Kennedy Meadows and then north on the spur road leading to the Kennedy Meadows Campground. Halfway to the campground I turned right onto a narrow dirt road leading to the Haiwee Pass TH (signed for Wildrose Trail at the pavement). To no great surprise, mine was the only car in the area when I pulled in before 9a on a Thursday morning. Notices at the TH indicated that the first two miles of the Haiwee Pass Trail near US395 had been washed out by flash floods. It seems doubtful that the Forest Service will rebuild that portion. One of the results of this decision is that although the portion from Kennedy Meadows that I would travel was unaffected, the trail would see less use than in former times and will probably slowly fall into disuse, except perhaps by hunters. I followed the trail for almost three miles to a saddle NW of Ball Mtn, just before the trail begins to descend to Wildrose Meadow (and thus the alternate name of the TH). I found the trail interesting because it was not like the usual Sierra footpath. This one did not have the rockwall engineering of a CCC crew nor switchbacks to make things easier for pack animals and backpackers. It followed the natural streambeds for the most part, often in the dry streambeds and felt more like what one would expect from an Indian trail, created over centuries of use. The course has been altered over the years, often to get the trail out of the sandy drainages and onto a new cut to the side, but most of it remains fairly primitive. According to Jenkin's guidebook from the early 1980s, this was once the Wildrose Cyclepath (meaning motorcycles, not bicycles). But the creation of the South Sierra Wilderness in 1984 effectively put an end to motorized travel along the route. The only water source I noted, besides the patchy snow, was a spring just before I reached the saddle. It has a fence around it to keep cattle from poluting the source and some sort of box around the outlet (for unknown purpose), but it was just a trickle that came out from under the enclosure. At the saddle where some old cattle fencing is found, I turned right and started up the steep slopes leading to Ball Mtn. Along with nearly 2,000ft of climbing in less than a mile, the forested slopes held far more snow than I had seen in the last few weeks. Most of it was less than four inches in depth and easy enough to cross, but some unconsolidated places up to eight inches in depth lay in wait to catch me unaware. As the hardest of the four hikes I would do today, it took just over two hours to reach the rocky summit. There was some scrambling to be had at the very top, but not enough to justify a visit. The views on the other hand were quite fine, especially to the south where Kennedy Meadows, Rockhouse Basin and most of the Domelands stretched out in that direction under the warm sunshine. To the west one cound see over the divide around Sherman Pass to the Greenhorn Mtns and Mineral King area. A small plume of smoke rose from somewhere in or around Mountain Home State Forest. It would still be burning when I returned a week later. To the north were some of the peaks of the High Sierra from Olancha to Langley and the Whitney region. A register held two business cards that pre-dated a MacLeod register left in 1976. Less than 12 pages had been used in the ensuing 38 years. The past year had seen three visitors, more than any year since the register had been placed, but I don't think that's a sign of increasing traffic. The return via the same route went a bit quicker thanks to the downhill direction and some jogging, getting me back to the car before 1p. Kennedy Peak is located just south of Kennedy Meadows and can be approached from a variety of directions. I chose to approach from the east side, driving to the end of the road to the landfill, just across the street from the fire station which got me just about a mile from the summit. The peak and surrounding area had been burned in the same 2000 Manter Fire as Pine Mtn, though not as badly as the latter. The disposal site was closed, but that mattered not since one can simply walk through the brushy flats just to the north in order to reach the base of the mountain. There is a dirt road running north-south along the eastern base of the peak which can be used to drive even closer if the one mile approach is too much. I had thought that this road might be too rough for the van, but from the looks of it when I crossed it, it's decently maintained. I followed the NE Ridge up to the summit, but this entailed some up and down scrambling near the top to get over a false summit or two. The easier route which I used on the descent goes more directly up the east side. One can even follow the dirt road several switchbacks to its end where the route is then less than half a mile. The rocky summit overlooks the Kennedy Meadows area on most sides. Ranching appears to be the main occupation of those that live here. The register was an odd assortment dominated by the fire crews stationed in Kennedy Meadows. There is some discourse regarding God, country and Kennedy Meadows as the center of the universe. The most recent entry was from notable San Diegans Richard Carey and Gail Hanna, seeking the summit as part of their bid for the SPS Explorer Emblem (50 non-SPS Sierra summits over 7,000ft). Like Kennedy Peak, there are numerous ways to reach Chimney Peak. 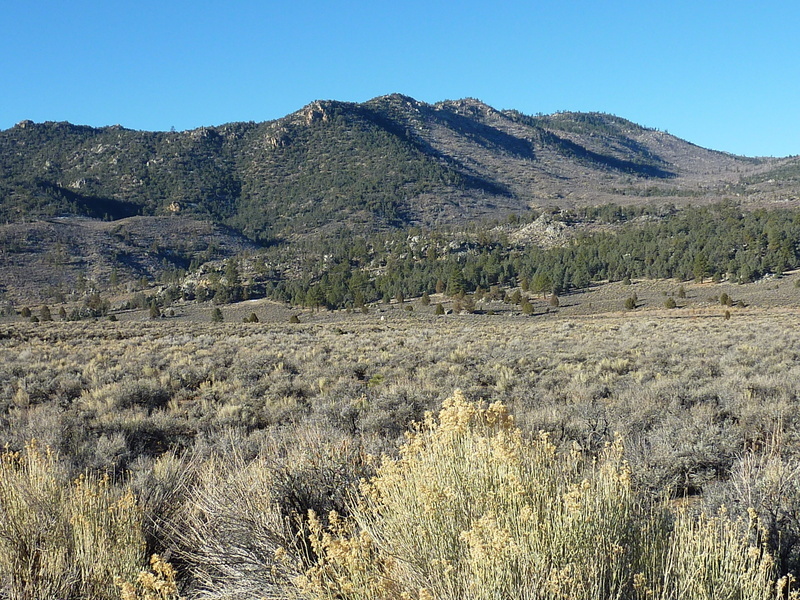 Located in the heart of the Chimney Peak Wilderness, 10 miles SE of Kennedy Meadows, the peak can be accessed by one of two good dirt roads to the north and east, or by the PCT which runs across its SW flank. The shortest route is from the north, starting near the gate that now closes to the public what used to be Chinmey Basin Loop Rd. The road was washed out just past a ranch some years ago, and rather than try and fix it, the BLM decided to let it go permanently and allow the rancher to gate the road upon his property. I ran into the rancher as I was driving the road aware of the washout but unaware of the gate. We stopped to converse in the act of passing each other in our vehicles. He was probably 70-75yrs of age, a rugged-looking gentleman who appears to have spent a lifetime as a rancher. He didn't greet me or bother with any pleasantries when he rolled down his window: "You're not going to go through the gate are you? I probably should have locked it, but I'm just going down to water the other horses." Not knowing there was a gate, I didn't know how to respond initially. I told him of my intention to climb Chimney Peak but he only looked at me with what could be described as a look of "You're lying, aren't you?" Even as I was assuring him that I would not pass any gate, I could see he wasn't really listening and was debating with himself whether he should back up and lock the gate, only about 100yds back. I think if I'd been under 30yrs of age that's exactly what he would have done, but I think my 53yrs played well on this one and he grudgingly decided I was just on the right side of his mental age-of-trustworthiness to not make it worth the extra effort. I almost wanted to drive onto his ranch and do donuts on his front porch just for the attitude, but of course I didn't. I was going to be abandoning my vehicle for longer than he would be gone from his ranch which gave him the upperhand in terms of vandalism potential. He also looked like the kinda guy who would keep a few loaded firearms under the bench seat so I wasn't going to mess with him anyhow. I parked just outside the gate, making sure to give him ample room to pass by and then set off for Chimney. This was probably the best hike of the four in terms of scrambling interest. The beginning was through lower-angled, forested slopes where I found an abandoned campershell on its side and some obsidian chips suggesting Indians had been this way even before the makeshift methlab folks. But very soon after the slope increases and stays fairly steep the remainder of the way, climbing more than 1,000ft in just over a half mile. I stuck mostly to the North Ridge of the east summit, bypassing most obstacles to the west and enjoying the views along the way. The route-finding involved weaving under trees and short rock scrambles, a fun combination. It took just about 3/4 hour to reach the summit at just under 8,000ft. In contrast to Pine Mtn earlier in the day, there was almost zero snow found on the route though only 300ft lower. From the summit one can see eastward down Ninemile Canyon to the Mojave Desert, south to the Chimney Creek drainage and the Scodie Mtns beyond. Views west are mostly blocked by a slightly higher ridgeline with Bear Mtn and unnamed peak 8,337ft. Similarly, to the north views to Kennedy Meadow are blocked by intervening mountains, but Olancha Peak is clearly visible towering above these well to the north. A tiny Smatko register placed in 1986 served until a decent one was installed a year later by a BLM party headed by John Newman. Newman was stationed at the Kennedy Meadows BLM fire station and made regular pilgrimages to this summit over the years, often with his dog. 25 pages of the register were filled over the next 25 years, more than I would have expected for an obscure peak. Most recently it was visited by highpointers Bob Packard and Dan Baxter who visited because it is a Wilderness highpoint. I'm not often out collecting these on purpose myself, more or less getting them as freebies along the way. The return went considerably faster, taking little more than half an hour. The gate was once again closed upon my return and my hope is that the property owner had just a tad of his faith in strangers rekindled. At least my car wasn't vandalized. Sean O'Rourke reports in his blog that there is an old road on the north that goes a considerable distance up the mountain. This may have been the road I crossed, but I didn't follow it in either direction. The topo map shows a 4WD road further west than my route going up to about 7,100ft. The satellite view shows more old roads than those depicted on the USGS topo map.